Marlene Gallup shares a photo from her wedding (photo on the top). 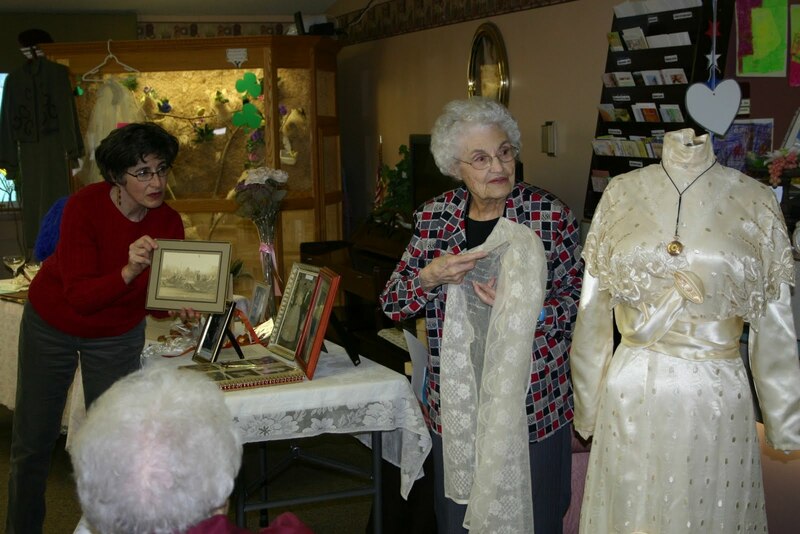 Karen Chapman and her mother, Luanna Sullivan show Luanna's brown wool wedding dress from 1938(photo on the bottom). 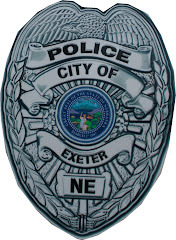 It was a trip down memory lane at the Exeter Care Center on Tuesday afternoon. 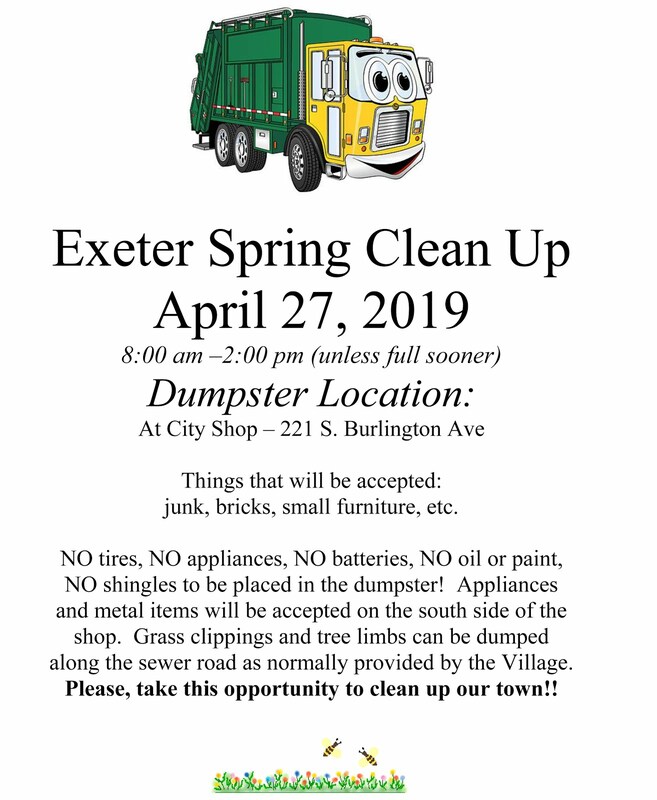 The Exeter G.F.W.C. 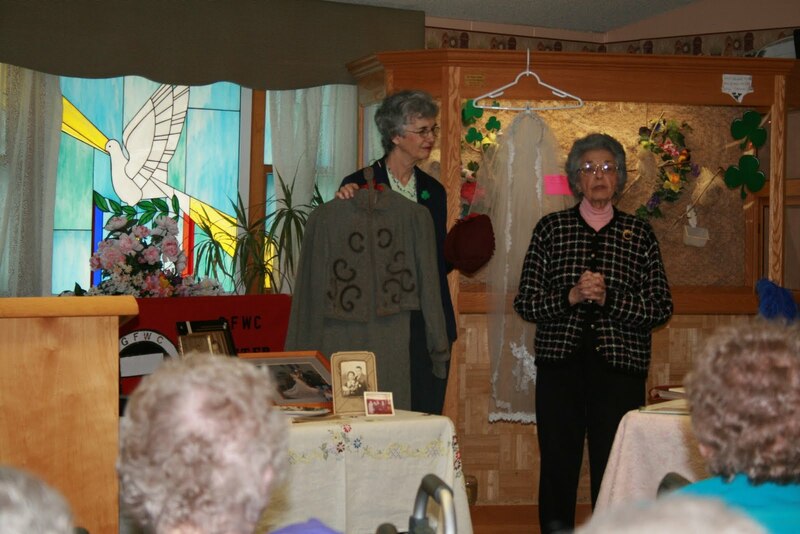 Woman's Club hosted a Wedding Memories Show in the activity room at the care center. The program began with favorite old "love songs" played on the suitcase organ by Marci Manwarren. The crowd enjoyed singing along with "A Bicycle Built for Two." 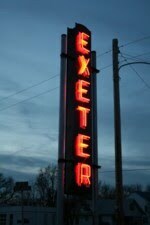 Exeter G.F.W.C. Woman's Club Co-President Marlene Gallup welcomed the crowd and explained the program for the day. 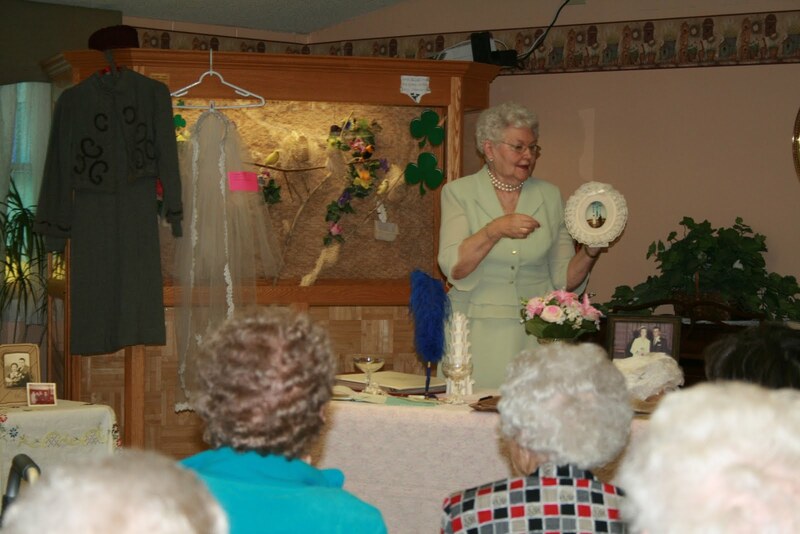 Barb Votipka presented a short program on the history of wedding traditions. her grandmother wore in 1914.
dressed as the bride did for safety reasons. This also carried over to the bridal bouquet made of garlic, herbs and grains, which were thought to keep evil away. It seems much of our wedding traditions can be traced back to the wedding of Queen Victoria. White dresses came to be in fashion after she wore one. The "something old, something new, something borrowed, something blue" tradition also harkens back to Victorian times. It seems all the trappings of a proper wedding have roots somewhere. Veils show modest, rings, the longest tradition were worn on the left hand because it was thought to have a vein that was directly connected to the heart. And of course the "honeymoon" which came about from couples drinking a sweet wine four months after their wedding. Sweet wine, like honey, and four moons became honeymoon. The members of the Woman's Club shared memories of their own weddings starting with Karen Chapman who brought her mother Luanna Sullivan. Luanna, who will be 92 next month, shared about getting married in the middle of the depression in 1938. She showed her brown wool wedding dress which she paid for on a weekly basis and shared about their leaving Nebraska immediately after their wedding to find greener pastures in California. Bonnie Cudaback showed her wedding photo, her wedding shoes and her album telling about their wedding lunch. Judy Dinneen shared a few momentos and talked about how their wedding took place as a blizzard was starting and her husband drove a maintainer that winter which was comparable to this years record snow and cold. Sue De Jonge shared how she took an airplane filled with servicemen to San Diego to marry her husband, Jim, who was in the service. Bethine Leif wore the earrings that she did in her wedding. Suzanne Johnson, who with husband, Roger, recently celebrated their 50th anniversary, showed her wedding hat, her dried bridal bouquet and bridesmaids flowers. Marlene Gallup had wedding pictures and also the beautiful veil of her daughter Linda Allen. Wilma Murphy showed the wedding dress of her own mother from 1914 which her own daughter, Rose, wore for her wedding. She also had the watch that her father gave her mother when they married which still works. Barb Votipka showed her blue going away suit from her wedding. Elaine Oldehoeft also shared some beautiful photographs. 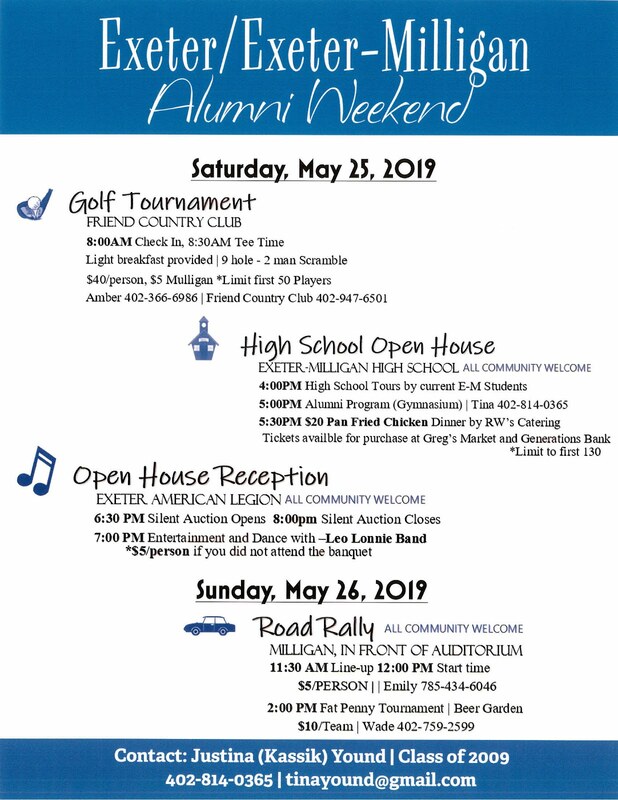 The residents and Woman's Club members enjoyed more songs from Marci and her organ followed by some of the residents sharing their own memories. Esther Deterding shared about her first marriage and losing her husband and then finding out about the dances in Milligan. She shared about adopting her daughters as well. One of the residents, Nancy Galusha, who recently lost her husband shared her wedding picture. Committee members for the event were Marlene Gallup, Barb Votipka and Bernice Hall. Bernice also provided the paper products for the event. After some more songs on the organ all were served wedding cake and punch in the dining room.